Pakistan is probably not the first destination budding academics think of when wanting to secure a foothold in higher education overseas. However, Pakistan can offer a great opportunity for the new post-PhD academic. This article examines how you can secure an academic position in Pakistan, and how the experience of teaching in higher education in Pakistan can potentially kick-start your academic career. Academic positions in Pakistan are most often advertised in local newspapers of which ‘The News’ and ‘Dawn’ are perhaps the best known. Unfortunately for those living outside of Pakistan the online versions of these newspapers are rather haphazard in uploading the appointments sections. An alternative route is to periodically visit the website of Pakistan’s Higher Education Commission (www.hec.gov.pk) which, in addition to offering a wealth of information on Pakistan’s higher education, occasionally lists vacant faculty positions. Individual university websites can also be useful and most universities will upload job opportunities onto their websites. If all else fails, then it is not uncommon to directly contact through email, the vice-chancellor of the University or the Head of Department of the institution you are interested in. Do not be perturbed by directly contacting these people, most will be delighted to hear from UK qualified PhDs. However, before beginning your networking it is vital that you have thoroughly researched your host institution; the best place to begin is the ‘top ten-ranking universities’ listed on the HEC website. Since Pakistan houses many sub-standard private universities, it important to be clear at the outset which institution you are prepared to work at to broaden your teaching experience. In addition to public sector universities, Pakistan has a handful of excellent private institutions like the Lahore Institute of Management Sciences (LUMS), the Ghulam Ishaq Khan Institute (GIK), and IBM Karachi. On the whole academic positions in Pakistan do not pay well, and unlike institutions in the Middle East will not pay relocation expenses. If you are being hired under the HEC’s ‘short term foreign faculty hiring program’ then you will be eligible for an economy class fare to/from your country of origin; otherwise the pay is certainly not comparable to the Middle East. 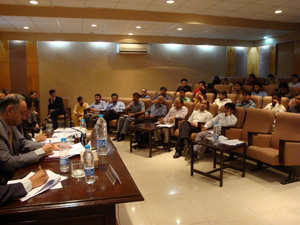 So what can higher education in Pakistan offer? Will welcome innovation in both teaching methods and course content. Set up a new peer-reviewed journal. In short your exposure to UK higher education is greatly valued. If you are creative, innovative, and willing to adapt, then a stint in Pakistan can offer a level of experience and exposure that new academics rarely get in the UK; that is, if they are one of the lucky few who do land a job following a PhD. Dr. Nazya Fiaz is a British academic who, having earned a PhD in 2010, currently works in Pakistan as an Assistant Professor of International Relations at the National Defence University (NDU). Dr. Fiaz has published in the European Journal of International Relations, the Journal of Strategic Security, and the Journal on Terrorism and Security Analysis. She is also the Senior Expert: Research for an EU-funded parliamentary project in Pakistan. Dr. Fiaz’s job seeking and teaching experience in Pakistan means that she can offer a genuine insider’s view into the higher education sector in Pakistan.